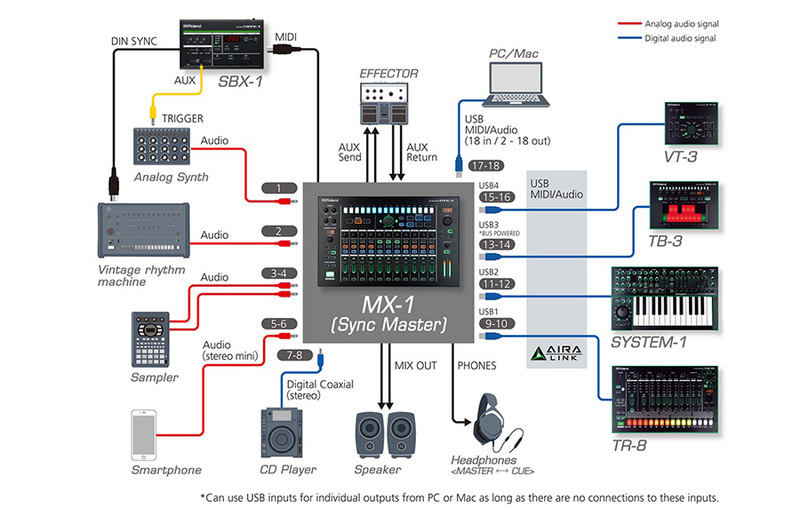 With six analog inputs, four AIRA Link USB ports, digital I/O, send and return jacks, and the ability to stream 18 channels to and from your DAW, the MX-1 brings together a wide range of musical sources and puts them directly under your fingertips. The MX-1 integrates effects in exciting new ways. Not only do the MX-1’s effects sound great, they’re designed for ready manipulation and rhythmic sensibility, thanks to the MX-1’s tempo awareness and the TR-style step interface. Four individual 1/4-inch jacks support just about any kind of instrument, and the stereo 1/8-inch jack is perfect for smartphones,and various gadgets. Four AIRA Link USB ports make connecting your AIRA gear literally plug and play. "It was cybermonday and I needed a mixer. I Set out in a web adventure scanning through numerous YouTube videos about current products but none seeemed to grab my attention.... well... that was until I saw the demo for the Roland aira mx-1. An acid assassin... a cloaked bass warrior commencing in a dramatic battle where the field was a laser filled warehouse. "It's... it's perfect" I said. I did more research on its USB capabilities and built in sidechaning and filters... it's all I've ever wanted in a mixer. I looked at my desk and noticed I had several other Roland aira products so I said to them "were gonna make this family work god damnit" after being helped tremendously on djtt chat (tnx Matias) the item was placed on backorder. 4 days or so went buy and it was already at my door. Well the following day I linked everything together... I'm normally unimpressed by everything but this device is special. I sidechained a saw and it was like I was gesaffelstein chain smoking while side chaining. Ok all jokes aside this piece of gear is awesome. I'm still finding new stuff out about it and having a TON of fun with it. Roland really set it hard with the aira line so I suggest picking this thing up. Side note just went to a demo for the dj-808 and it syncs with it so you can on time switch into a live set or get really crafty in the studio. Sliders feel great and knobs feel great. Grab some after market caps if you like bigger knobs though. The effects sound good but like stated earlier.... the ability to slice/filter/sidechained each channel on the step sequencer is beyond cool. People are doing some really cool stuff with it so go check the videos out. Haven't found any downsides to it yet. If you get this item be warned... you get sucked into a vortex when you turn it on then you wind up hours in the future wondering how it's 3am. " AD block INPUT 1–4: 100 dB typ. AD block INPUT 5/6: 100 dB typ. DA block MIX OUT: 108 dB typ.